In our integrated world, decisions made by rich countries about their own policies and behaviour have repercussions for people in developing nations. At the same time, greater prosperity and security in poorer countries benefit the whole world. They create new economic opportunities, increase innovation, and help reduce risks posed by public health, security, and economic crises. The Commitment to Development Index (CDI) celebrates countries whose policies benefit not only themselves, but also the development of others, and promote our common good. We use thousands of data points across more than a hundred indicators to measure each policy component and come up with overall rankings. Countries score well for things like generous and high-quality aid, financial transparency, low barriers to trade for developing countries, and migration policies that are open and promote integration. They also do well for policies that enhance global public goods, for example robust support for technological research and development, protecting the environment, and contributions to global security like peacekeeping contributions and avoiding arms sales to poor and undemocratic nations. Like the Sustainable Development Goals, the CDI recognizes that development progress is holistic. But while the SDGs focus on outcomes and all nations, the CDI emphasizes how the policies of the richest countries can make a huge difference. CDI 2017 Results: How well are countries doing? Denmark tops this year's Commitment to Development Index; Scandinavian countries make up the top three. Denmark scores consistently well across the seven components of the CDI, ranking first on security and aid, and featuring in the top three for trade and finance. But Denmark has room for improvement in migration, where it ranks in the bottom half. Even though it takes a large share of international refugees, Denmark accepts the lowest proportion of students from developing countries of all countries assessed. Sweden and Finland follow Denmark in the top three. These countries all show consistently good performance across nearly all categories. Sweden shows the biggest support for the global climate and biodiversity, ranking first on environment. Finland is top in finance. Germany improves substantially but France is still top amongst G7 countries. Germany moves up to fifth on the 2017 Index, mainly thanks to policies on migration, including accepting a large number of refugees. Germany has also improved in the technology, trade, environment, and aid components, meeting the international commitment of 0.7 percent of national income on overseas development assistance. But it ranks in the bottom third on finance and security. France maintains its position as the top-ranked G7 nation, performing above average in security, technology, trade, finance, and environment. France could improve by reducing barriers to service trade, integrating migrants, and building on its progress to increase the 0.38 percent of national income it spends on overseas aid. The United Kingdom ranks joint seventh on this year's CDI, performing most strongly on aid and trade but below average on technology and migration. The UK has a relatively high proportion of students from developing countries but could improve by taking a larger share of asylum seekers and increasing its refugee acceptance rate. The United States ranks 23rd of 27; outranked by Visegrád Central European countries. The United States is now outscored by each of the Central European Visegrád countries (Hungary, the Czech Republic, the Slovak Republic, and Poland), whose income per head is less than half that in the United States. 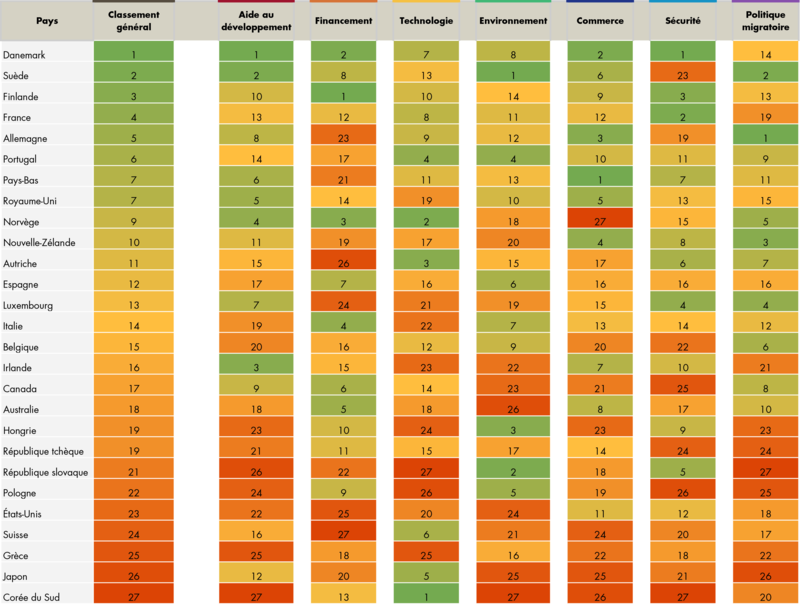 The Slovak Republic and Hungary do particularly well (second and third respectively) on environment. The US's best performance is in the trade and security components. However, it scores poorly on finance, environment, and aid, giving 0.18 percent of national income—well short of the international agreement of 0.7 percent. The US withdrawal from the Paris Climate Accord will be reflected in future years, potentially taking the US score lower. South Korea and Japan are at the bottom of the CDI. South Korea ranks last, with Japan just one place above at 26th. 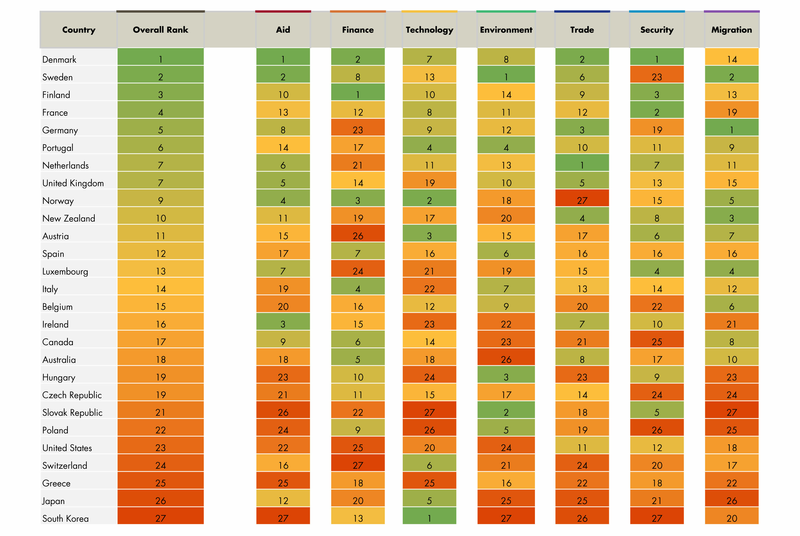 South Korea's scores on environment and security are the lowest in the CDI, while Japan is close to bottom on security, migration, environment, and trade. Both countries, however, score well on the technology component, with South Korea ranking first and Japan fifth. In fact, most countries in the CDI have one or more indicator where they perform much less well than in other areas. This shows how countries could spread prosperity simply by raising their performance to the level of other countries. Several indicators—including technology, environment, and trade—have seen improvements from a majority of CDI countries since last year's index. On environment, almost all countries have seen reductions in greenhouse gas emissions and reductions in tropical wood imports, while some made new climate commitments under the Paris agreement. On technology, improvements in intellectual property rights have helped disseminate knowledge. Within the trade component, two-thirds of countries reduced their levels of agricultural subsidy. On migration, the Index is the only measure that takes a holistic look at countries' policies on migration as well as their openness to refugees, asylum seekers, and overseas students. In the last two years, there have been significant improvements in migration scores as several countries accommodated large numbers of asylum seekers and refugees. Despite this, there remain remarkable variations in approach; for example, some countries, like Austria and Spain, gave positive decisions to over three-quarters of asylum seekers, while for four countries that fraction is under one in ten. Although only a handful of countries meet the internationally accepted target of spending 0.7 percent of gross national income on aid, foreign assistance remains an important source of finance for some of the poorest countries. The CDI rewards countries that give more aid than their peers as a share of their GNI, but it also rewards the quality of aid as measured by the most recent Quality of Official Development Assistance (QuODA) assessment. QuODA examines each donor's development assistance on 31 indicators of the accepted aid-effectiveness principles of development impact, fostering institutions, reducing burdens on recipients, and promoting transparency. Denmark's first place is a combination of generosity (it provides 0.75 percent of national income, although less than in previous years) and the effectiveness of its aid. In terms of quantity, Norway and Luxembourg are very generous, giving 1.11 and 1 percent of GNI respectively, and Spain has doubled its aid contributions to 0.33 percent of GNI. South Korea (0.14 percent) and the Slovak Republic (0.12 percent) perform poorly, along with the United States, which is the biggest donor in absolute terms but spends just 0.18 percent of national income on aid. Aid quality measures relate to the latest available QuODA assessment. This shows that Ireland ranks highest, with the best bilateral program, while Canada is fourth, with the most effective multilateral assistance (based on the quality of the multilateral agencies countries chose to fund). Denmark (second) and the UK (third) also do well on aid quality. Italy and Belgium score at the bottom on bilateral aid quality, while New Zealand and the United States could improve their scores by stepping up their share of funding to multilaterals. Foreign direct investment is the largest source of financing for many developing countries, with benefits to infrastructure, housing, transport, energy supply, and many other areas. Successful investment in the developing world can benefit everyone. The CDI therefore rewards wealthy countries with investment-promotion policies that are good for the investors and for the developing country by protecting their public policy interest and sustainable development. This is assessed through considering the balance in international investment agreements. Policies that allow for financial secrecy, in contrast, enable tax evasion, money laundering, and corruption that are estimated by some experts to cost developing countries billions of dollars and degrade governance and international security. Using data from the Financial Secrecy Index (FSI), the CDI recognizes countries that have regulations in place to promote transparency in financial transactions within their jurisdiction and their sphere of influence. Finland's first place on finance is thanks to sustainable support to investment and transparency in the financial sector; Denmark, Norway, and Italy take the next three places. Despite its strong commitment to international investment frameworks, where it occupies the top position, Switzerland ranks last on finance because of its poor score on the Financial Secrecy Index. The Netherlands, the United Kingdom, and the United States are penalized for enabling secrecy jurisdictions within their sphere of influence. Canada has the most sustainable bilateral international investment agreements with developing countries in place, while South Korea reports the highest investment to developing countries which do not qualify as ODA (other official flows). Medicine, sustainable energy, information and communication technology, and other technological advances improve the lives of all of us. Technologies invented in rich countries, such as vaccines, the Internet, mobile phones, and high-yielding grains have improved—and saved—many lives. But rich countries can also impede the diffusion of knowledge and technology with overly restrictive protections for intellectual property rights. The CDI rewards government support for research and development (R&D) and policies that facilitate the creation and dissemination of innovations of value to developing countries. It marks countries down for policies on intellectual property rights that can inhibit the international flow of innovations. South Korea, Norway, and Austria are top performers on the technology component, thanks mainly to government and business expenditure on R&D, with Portugal close behind in fourth. South Korea's business expenditures on R&D exceed 1 percent of GDP even discounting research on defence. Its government spends 1.47 percent on R&D. Poland and the Slovak Republic rank last on technology, spending only around 0.4 percent of GDP on government support to R&D. Alongside Greece, the Slovak Republic has one of the lowest business expenditures on R&D. New Zealand’s legislation on intellectual property rights (IPR) is the most development friendly, followed by Canada and Australia. Greece performs poorly on the IPR sub-component, along with the category leader South Korea. Greece could improve its right loss provisions and South Korea its stringent patent coverage laws, which currently limit the spread of technology to developing countries. Rich countries are most responsible for man-made climate change, but poor countries will suffer the most. They are more susceptible geographically, have less money and capacity to deal with the effects, and many more of their people depend directly on their surrounding environment to meet their daily needs. Healthy ecosystems provide shelter, clean water and energy, food security, and income opportunities. Many policies and actions of richer countries degrade the natural resources on which the poor depend. The CDI rewards countries for decreasing greenhouse gas emissions, implementing high gas taxes, not subsidizing the fishing industry, cutting imports of illegally harvested tropical timber, and committing to important international conventions. These measures benefit all countries. Sweden is the CDI leader on environment policies, nudging the Slovak Republic into second. Sweden's greenhouse gas emissions are the lowest and it reports the biggest average annual cut in these emissions in the last years. The Slovak Republic performs well partly because of its high gasoline taxes. Hungary, Portugal, and Poland share third place. Canada and New Zealand are rewarded for low tropical timber imports. Belgium improved its score significantly this year, with progress on biodiversity treaties and timber imports. South Korea takes last place with its limited commitment to biodiversity treaties' obligations and its high imports of tropical timber. Japan and Australia also import a lot of tropical timber and so also lag on the environment component. Australia also ranks poorly because it produces a large amount of greenhouse gas emissions. The United States ranks 24th, partly due to having the lowest gasoline taxes of all CDI countries. Trade provides poorer countries with opportunities to attract investment, create jobs, and reduce poverty. With rich countries in control of the largest markets, some goods that poor countries are best at producing still face trade barriers. High tariffs, domestic subsidies that create an uneven playing field for agricultural goods from poor countries, and burdensome red tape and legal restrictions all make trade harder for developing countries. The CDI rewards wealthy countries most open to goods from developing countries, with low tariffs, few subsidies for agriculture and streamlined importation processes. Like much of the CDI, these are policies that benefit consumers and taxpayers in all countries. The Netherlands takes the top spot on trade mainly because of its openness to trade in services and relatively few restrictions to imports. Denmark and Germany rank second and third respectively. Norway, South Korea, and Japan are at the end of the trade table. South Korea and Japan have the highest tariff rates, limiting market access for developing country producers. Norway, Ireland and Switzerland have high subsidies on agriculture, with support exceeding a quarter of the sector's output. Still, Switzerland did well to cut subsidies from 38 percent in 2015 to 28 percent in 2016. Germany and Ireland have the fewest restrictions on imports of services, according to the Service Trade Restrictions Index, whereas Denmark has the least burdensome import procedures. In contrast, both the Czech Republic and Slovak Republic strain importers with the most red-tape measures. The United States is ahead of the pack on low import tariffs. Security and development are closely linked. War and political violence can destroy livelihoods and public institutions, while poverty and institutional weakness make it easier for political violence and war to erupt. Such conflicts do not respect borders; it is therefore in the interest of all countries to support peace and international security. The CDI rewards countries for contributing to peacekeeping and humanitarian interventions, for basing naval fleets where they can secure sea lanes, and for participating in international security regimes that promote non-proliferation, disarmament, and international rule of law. The CDI penalizes countries for some exports of arms, especially to nations with undemocratic regimes, and for not publishing data on arms exports. Denmark leads the ranking on security as it is a significant contributor to internationally sanctioned peacekeeping and humanitarian interventions. It has also ratified all nine international security conventions measured in the CDI. France ranks second despite its relatively numerous arms exports. The United States contributes the largest proportion of GDP to peacekeeping missions and international sea lanes protection. However, it is penalized for not ratifying the Arms Trade Treaty, the Ottawa Convention, and the Convention on Cluster Munitions, and for not being party to the Comprehensive Nuclear Test Ban Treaty and the International Criminal Court. South Korea ranks last on security because of its limited contributions to international peacekeeping efforts, incomplete support for the international security regime, and a lack of data on arms exports. Poland is also close to the bottom for its low contribution to peacekeeping operations and its failure to ratify the Convention on Cluster Munitions. Australia is penalized for not making arms industry export data publicly available, and the Czech Republic due to its large arms exports to poor or undemocratic countries. Labour mobility is potentially the most powerful tool for poverty reduction and income redistribution. By migrating to richer countries, workers gain valuable skills and broaden their opportunities to earn higher incomes. They also send billions of dollars back home each year in remittances, a flow that surpasses foreign aid several fold. The receiving country also benefits from the contribution that migrants make to the economy and society. The CDI rewards countries for welcoming migrants and students from developing countries, accepting refugees and asylum seekers, embracing migrant-friendly integration policies, and signing up to important international conventions protecting the rights of migrants. Germany takes first place on migration, mainly for accepting a large number of migrants, asylum seekers, and refugees. Sweden and New Zealand rank second and third. Sweden accepts a high share of refugees, New Zealand welcomes many foreign students, while they both offer good integration policies. South Korea and Greece have both improved their performance compared to last year. Luxembourg has the highest rate in accepting migrants overall (weighted by poverty of the country of origin of migrants). The Slovak Republic ranks at the bottom of the migration component. Poland and Japan also rank poorly due to their low migrant acceptance rate and their low score on their integration policies. The Czech Republic also ranks close to the bottom of the table. 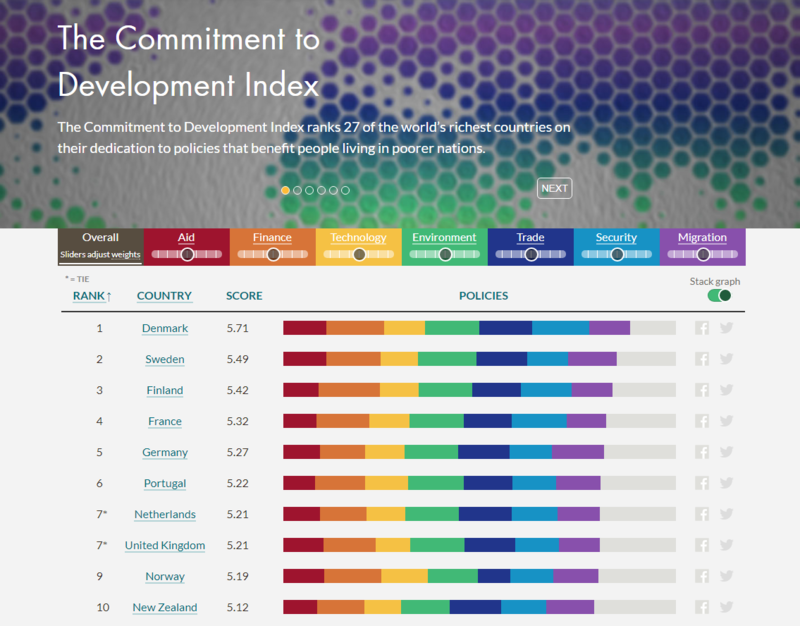 Visit cgdev.org/cdi to explore the Commitment to Development Index, including full country reports, interactive web portal, podcast, full calculations, and method paper. The Center for Global Development (CGD) has compiled the Commitment to Development Index each year since 2003. CGD is an independent think tank that works to reduce global poverty and equality through rigorous research and active engagement with the policy community. CGD Europe deputy director and senior policy fellow Ian Mitchell directs the Index, building on the work of CGD vice president Owen Barder, and of former senior fellow David Roodman. Anita Käppeli, policy analyst, composes and leads the development of the CDI. The Index is supported by the CDI Consortium, which in 2017 included Australia, Canada, Denmark, France, Germany, and Norway. The content of this report does not reflect the official opinion of the Consortium members. Responsibility for the information and views expressed therein lies entirely with the authors. Compte tenu de l’intégration mondiale actuelle, les décisions des pays riches pour leur politique et leur comportement ont des répercussions sur les populations des pays en développement. De la même façon, une prospérité et une sécurité accrues des pays les plus pauvres profitent au monde entier. Elles créent de nouvelles opportunités économiques, stimulent l’innovation, contribuent à réduire les risques sanitaires, sécuritaires et les crises économiques. L’Indice de l’engagement pour le développement (CDI) met en avant les pays dont les politiques ne visent pas seulement leurs intérêts propres mais le développement d’autrui et l’intérêt général. Nous utilisons des milliers de données provenant d’une centaine d’indicateurs pour définir les classements globaux et pour chaque domaine analysé. Les pays enregistrent de bons résultats dans les domaines suivants : aide au développement généreuse et de bonne qualité, transparence financière, faibles barrières commerciales favorisant les échanges avec les pays en développement, politique migratoire ouverte et encourageant l’intégration. Ils affichent aussi de bonnes performances pour les politiques qui mettent en valeur les biens publics mondiaux. Par exemple, ils apportent un appui rigoureux à la recherche et au développement technologique, à la protection de l’environnement et contribuent à la sécurité mondiale par le soutien aux missions en faveur de la paix, et tentent d’empêcher la vente d’armes aux nations pauvres et non démocratiques. À l’instar des objectifs de développement durable (ODD), le CDI reconnait que les avancées en matière de développement sont holistiques. Cependant, alors que les ODD se concentrent sur les résultats et sur toutes les nations, le CDI met l’accent sur la façon dont les politiques des pays les plus riches peuvent faire une énorme différence. Résultats 2017 du CDI : Quels sont les résultats des pays évalués par le CDI ? Le Danemark arrive en tête de l’Indice de l’engagement pour le développement ; les pays scandinaves représentant le trio de tête. Le Danemark obtient de bons résultats dans les sept domaines du CDI, il s’affiche en tête pour la sécurité et l’aide au développement et dans le trio de tête pour le commerce et le financement. Il peut néanmoins améliorer ses résultats en matière de politique migratoire pour laquelle il figure dans la seconde moitié du classement. Même s’il accueille une part importante des réfugiés internationaux, le Danemark est, parmi les pays évalués, celui qui accepte la plus faible proportion d’étudiants en provenance des pays en développement. La Suède et la Finlande suivent le Danemark dans le classement. Ces pays affichent de bonnes performances dans presque toutes les catégories. La Suède est le pays qui contribue le plus aux efforts en faveur du climat mondial et de la biodiversité, se classant premier dans le domaine de l’environnement. La Finlande se classe au premier rang sur le domaine du financement. L’Allemagne s’améliore substantiellement, mais la France reste en tête des pays du G7. L’Allemagne se hisse à la 5e place dans l’Indice 2017, principalement grâce à sa politique migratoire, notamment par l’accueil d’un grand nombre de réfugiés. L’Allemagne s’est également améliorée dans les domaines de la technologie, du commerce, de l’environnement et de l’aide au développement, respectant l’engagement international de consacrer 0,7 % du revenu national à l’aide au développement. Elle se classe cependant dans le dernier tiers pour le financement et la sécurité. La France conserve sa position à la tête des nations du G7, avec des résultats supérieurs à la moyenne pour les domaines suivants : sécurité, technologie, commerce, financement, et environnement. La France pourrait améliorer ses résultats en réduisant les obstacles au commerce des services, en intégrant les migrants et en s’appuyant sur ses progrès pour augmenter les 0,38 % du revenu intérieur qu’elle consacre à l’aide au développement. Le Royaume-Uni se classe 7e cette année, avec de bons résultats dans les domaines de l’aide au développement et du commerce mais des résultats inférieurs à la moyenne dans ceux de la technologie et des politiques migratoires. Le Royaume-Uni accueille une proportion assez élevée d’étudiants de pays en développement mais pourrait améliorer ces résultats en accueillant davantage de demandeurs d’asile et en augmentant son taux d’acceptation des réfugiés. Les États-Unis se classent 23e sur 27, devancés les pays d’Europe centrale du groupe de Visegrád. Les États-Unis sont désormais devancés par les pays de ce groupe (Hongrie; République tchèque, Slovaquie et Pologne) dont le revenu par habitant est inférieur de plus de la moitié à celui des États-Unis. La Slovaquie et la Hongrie sont particulièrement performantes dans le domaine de l’environnement (deuxième et troisième respectivement). Les meilleures performances pour les États-Unis se situent dans les domaines du commerce et de la sécurité. Cependant, les États-Unis enregistrent de faibles résultats dans le domaine du financement, de l’environnement et de l’aide au développement, consacrant 0,18 % de son revenu intérieur, bien en deçà de l’engagement international de 0,7 %. Le retrait des États-Unis de l’Accord de Paris sur le climat sera pris en compte dans les années à venir, et pourrait dégrader davantage les résultats des États-Unis dans ce domaine. La Corée du Sud et le Japon figurent en bas du CDI. La Corée du Sud se retrouve en dernière position, le Japon figurant à la 26e place. Les résultats de la Corée du Sud dans le domaine de l’environnement et de la sécurité sont les plus faibles du CDI, le Japon se rapprochant des derniers pour la sécurité, les politiques migratoires, l’environnement et le commerce. Les deux pays affichent cependant de bons résultats pour les domaines technologiques, la Corée du Sud étant au premier rang, et le Japon en cinquième position. En fait la plupart des pays du classement, ont au moins un indicateurs qui présente des résultats bien inférieurs aux autres. Cela montre qu’il suffirait que les pays portent leurs performances au niveau des autres pays pour faire profiter de la prospérité à un plus grand nombre. Avancée globale dans les domaines de l’environnement et de la technologie et diminution des subventions agricoles. La majorité des pays évalués par le CDI se sont améliorés au regard de plusieurs indicateurs — notamment la technologie, l’environnement et le commerce — depuis le dernier rapport. Dans le domaine de l’environnement, la quasi-totalité des pays ont réduit leurs émissions de gaz à effet de serre et l’importation de bois tropicaux. D’autres pays ont pris des engagements supplémentaires dans le cadre de l’Accord de Paris. Dans le domaine de la technologie, des avancées sur la question des droits de la propriété intellectuelle ont contribué à la diffusion du savoir. En ce qui concerne le commerce, les deux tiers des pays ont réduit leur niveau de subvention agricole. Sur la question des politiques migratoires, l’Indice est la seule mesure adoptant une perspective globale sur les politiques nationales en matière de migration et d’ouverture aux réfugiés, demandeurs d’asile et étudiants étrangers. Au cours des deux dernières années, les résultats en matière de politique migratoire se sont améliorés de manière significative puisque de nombreux pays ont accueilli un grand nombre de demandeurs d’asile et de réfugiés. Toutefois, l’approche reste sensiblement différente selon les pays. Certains, comme l’Autriche et l’Espagne ont donné des suites positives à près de trois quarts des demandeurs d’asile, pour d’autres pays, cette proportion se situe à un sur dix. Bien qu’une poignée seulement de pays ait atteint l’objectif adopté au plan international de consacrer 0,7 % du revenu national brut (RNB) à l’aide au développement, l’aide internationale reste une source importante de financement pour certains des pays les plus pauvres. Le CDI récompense les pays qui consacrent une part plus importante de leur RNB à l’aide au développement que leurs pairs, mais l’indicateur récompense aussi la qualité de l’aide, telle qu’elle est mesurée par la dernière évaluation de la QuODA (qualité de l’aide publique au développement). La QuODA examine l’aide au développement fournie par chaque donneur au regard de 31 indicateurs correspondant aux principes admis en matière d’efficacité de l’aide à savoir l’incidence sur le développement, renforcement des institutions, réduction de la charge pour les récipiendaires de l’aide et promotion de la transparence. Le Danemark doit sa première place à la fois à sa générosité (il consacre 0,75 % de son revenu national à l’aide même si ce pourcentage a baissé par rapport aux années précédentes) et à l’efficacité de son aide. La Norvège et le Luxembourg sont également très généreux et offrent respectivement 1,11 et 1 % de leur RNB. L’Espagne a, elle, doublé sa contribution pour atteindre 0,33 % de son RNB. La Corée du Sud (0,14 %) et la République slovaque (0,12 %) affichent de faibles performances, tout comme les États-Unis, qui sont les plus gros donneurs en termes absolus mais ne consacrent que 0,18 % de leur revenu intérieur à l’aide au développement. Les mesures de la qualité de l’aide au développement se réfèrent aux dernières évaluations disponibles de la QuODA. Elles montrent que l’Irlande se place en première position avec le meilleur programme bilatéral ; le Canada est quatrième, avec l’aide multilatérale la plus efficace (selon la qualité des agences multilatérale que les pays choisissent de financer). Le Danemark (second) et le Royaume-Uni (troisième) obtiennent également de bons résultats sur la qualité de l’aide. L’Italie et la Belgique se retrouvent en bas du classement sur la qualité de l’aide bilatérale, tandis que la Nouvelle-Zélande et les États-Unis pourraient améliorer leurs résultats en accroissant leur part de financement aux organismes multilatéraux. L’investissement direct étranger est la source la plus importante de financement pour de nombreux pays en développement et profite aux domaines des infrastructures, du logement, des transports, de l’approvisionnement en énergie et à bien d’autres. Des investissements fructueux dans les pays en développement peuvent profiter à tous. Ainsi le CDI récompense les pays riches dont les politiques de promotion des investissements sont profitables aux investisseurs et au pays en développement et protègent leurs intérêts et le développement durable. C’est l’équilibre dans les accords internationaux d’investissement qui permet d’évaluer cet aspect des choses. Les politiques qui permettent l’opacité financière, au contraire, encouragent l’évasion fiscale, le blanchiment d’argent et la corruption qui, selon certains experts, coûtent des milliards de dollars aux pays en développement et détériorent la gouvernance et la sécurité internationale. En utilisant les données de l’indice de l’opacité financière, le CDI reconnaît les pays dont réglementations encouragent la transparence des transactions financières sur leur territoire et dans leur sphère d’influence. La Finlande tient la première place dans le domaine du financement grâce à son appui durable à l’investissement et à la transparence du secteur financier. Le Danemark, la Norvège et l’Italie suivent la Finlande dans le classement. Malgré son ferme engagement dans les cadres d’investissement internationaux, pour lesquels elle figure en tête de classement, la Suisse se classe dernière dans les domaines du financement du fait de ses faibles résultats sur l’indice de l’opacité financière. Les Pays-Bas, le Royaume-Uni et les États-Unis sont pénalisés à cause des territoires situés dans leur sphère d’influence qui permettent l’opacité. C’est le Canada qui a mis en place les accords bilatéraux des plus durables les pays en développement, tandis que la Corée du Sud enregistre des niveaux plus élevés d’investissements qui ne sont pas considérés comme de l’aide publique au développement dans les pays en développement (autres flux publics). La médecine, les énergies renouvelables, les technologies de l’information et de la communication et les autres avancées technologiques améliorent nos vies à tous. Les technologies découvertes dans les pays riches, comme les vaccins, l’Internet, les téléphones portables et les céréales à haut rendement ont amélioré et sauvé de nombreuses vies. Cependant, les pays riches peuvent aussi faire obstacle à la diffusion du savoir et des technologies avec des protections des droits intellectuels excessivement restrictives. Le CDI récompense les autorités nationales qui soutiennent la recherche et le développement et les politiques qui facilitent la création et la diffusion des innovations utiles aux pays en développement. Il pénalise les pays dont les politiques sur les droits de propriété intellectuelle entravent le flux international d’innovations. La Corée du Sud, la Norvège et l’Autriche obtiennent de très bons résultats dans le domaine de la technologie principalement grâce aux dépenses réalisées par l’État et les entreprises dans la recherche et le développement. Le Portugal les suit de près à la quatrième place. Les dépenses des entreprises sud-coréennes en recherche et développement sont supérieures à 1 % du PIB même si on exclut le poste de la recherche dans le domaine de la défense. Son gouvernement dépense 1,47 % en recherche et développement. La Pologne et la République slovaque arrivent en dernier dans le domaine de la technologie, consacrant seulement 0,4 % du PIB à l’aide publique en recherche et développement. Avec la Grèce, les entreprises slovaques affichent l’un des niveaux les plus bas de dépenses réalisées en recherche et développement. La Nouvelle-Zélande possède la législation relative aux droits de propriété intellectuelle la plus favorable au développement, suivie par le Canada et l’Australie. La Grèce obtient de faibles résultats dans la sous-composante des droits de propriété intellectuelle, de même que le chef de file dans cette catégorie, la Corée du Sud. La Grèce pourrait améliorer les provisions en cas de perte de droits et la Corée du Sud ses lois contraignantes en matière de protection des brevets, qui limitent à l’heure actuelle la diffusion de la technologie aux pays en développement. Les changements climatiques anthropiques sont en grande partie dus aux pays riches, mais ce sont les pays pauvres qui en subiront le plus les conséquences. Ils sont plus exposés géographiquement, ont moins de moyens financiers et de capacités pour en gérer les effets et une proportion bien plus large de leur population dépend de leur environnement immédiat pour satisfaire leurs besoins journaliers. Dans un écosystème sain, la population bénéficie d’abris, d’eau salubre, d’énergie propre, de sécurité alimentaire et de revenu. De nombreuses politiques et mesures des pays riches détériorent les ressources naturelles dont les pays pauvres dépendent. Le CDI récompense les pays qui réduisent leurs émissions de gaz à effet de serre, mettent en place des taxes élevées sur les carburants, ne subventionnent pas le secteur de la pêche, stoppent les importations des bois tropicaux récoltés illégalement et s’engagent dans des conventions internationales majeures. Ces mesures profitent à tous les pays. La Suède figure en tête du classement du CDI sur les politiques environnementales, plaçant la République slovaque en deuxième position. Le niveau des émissions de gaz à effet de serre de la Suède est le plus bas et celle-ci enregistre la moyenne la plus élevée de réduction de ces émissions des dernières années. Les résultats de la République slovaque sont bons, en partie grâce à ses taxes élevées sur l’essence. La Hongrie, le Portugal et la Pologne partagent la troisième place. Le Canada et la Nouvelle-Zélande sont récompensés pour leur faible importation de bois tropicaux. La Belgique a amélioré de manière significative ses résultats cette année, grâce à ses avancées sur les traités sur la biodiversité et l’importation de bois. La Corée du Sud prend la dernière place en raison de la faiblesse de ses engagements à l’égard des obligations liées aux traités sur la biodiversité et de ses fortes importations de bois tropicaux. Le Japon et l’Australie importent également beaucoup de bois tropicaux et sont aussi à la traîne en ce qui concerne la composante environnementale. L’Australie doit également ses mauvais résultats à ses niveaux élevés d’émission de gaz à effet de serre. Les États-Unis se retrouvent en 24e position, en partie à cause de son taux d’imposition des carburants le plus faible des pays évalués par le CDI. Le commerce offre aux pays les plus pauvres des occasions d’attirer les investissements, de créer des emplois et de réduire la pauvreté. Les pays riches contrôlant les marchés les plus importants ; les pays pauvres restent confrontés à des barrières commerciales pour des produits qu’ils sont pourtant les meilleurs à produire. Les tarifs douaniers élevés, les subventions nationales créent des conditions défavorables pour les produits agricoles des pays pauvres, et les lourdeurs administratives et contraintes juridiques rendent les échanges commerciaux plus difficiles pour les pays en développement. Le CDI récompense les pays riches les plus ouverts aux biens en provenance des pays en développement, avec des droits de douane peu élevés, peu de subventions pour l’agriculture et des processus d’importation rationalisés. Comme la plupart des politiques évaluées par le CDI, ces politiques profitent aux consommateurs et aux contribuables de tous les pays. Les Pays-Bas prennent la première place pour le commerce principalement en raison de son ouverture au commerce des services et de restrictions aux importations relativement peu nombreuses. Le Danemark et l’Allemagne se classent respectivement deuxième et troisième. La Norvège, la Corée du Sud et le Japon sont au bout de la table des négociations. La Corée du Sud et le Japon ont les droits de douane les plus élevés, ce qui limite l’accès des marchés aux pays en développement producteurs. La Norvège, l’Irlande et la Suisse ont des subventions agricoles élevées, avec un appui supérieur au quart de la production du secteur. La Suisse a néanmoins bien réussi à réduire les subventions qui sont passées de 38 % en 2015 à 28 % en 2016. L’Allemagne et l’Irlande imposent moins de restrictions sur les importations de services, selon l’indice de restrictivité des échanges de service, tandis que le Danemark affiche les procédures d’importation les moins pesantes. En revanche, la République tchèque et la République slovaque épuisent les importateurs avec la quantité de formalités administratives qu’ils leur imposent. Les États-Unis arrivent en tête du peloton avec des droits de douane à l’importation peu élevés. La sécurité et le développement sont étroitement liés. La guerre et la violence politique peuvent détruire les moyens de subsistance et les institutions publiques, tandis que la pauvreté et la faiblesse des institutions favorisent l’éruption de la violence politique et la guerre. De tels conflits ne s’arrêtent pas aux frontières ; il est donc dans l’intérêt de tous les pays de soutenir la paix et la sécurité internationale. Le CDI récompense les pays qui contribuent aux opérations de maintien de la paix et aux interventions humanitaires, positionnent des flottes militaires pour sécuriser les voies maritimes et participent aux systèmes de sécurité internationaux encourageant la non-prolifération de l’armement, le désarmement et l’État de droit international. Le CDI pénalise les pays pour certaines exportations d’armes, en particulier à destination des régimes non démocratiques, et pour la non-publication de données sur les exportations d’armes. Le Danemark figure en tête du classement sur la sécurité car il contribue fortement aux opérations de maintien de la paix et aux interventions humanitaires approuvées sur le plan international. Il a également ratifié les neuf conventions de sécurité internationales évaluées dans le CDI. La France se classe en deuxième position malgré ses exportations d’armes relativement nombreuses. Les États-Unis sont le pays qui consacre la plus importante part du PIB aux opérations de maintien de la paix et à la protection internationale des voies maritimes. Cependant, ils sont pénalisés pour n’avoir pas ratifié le Traité sur le commerce des armes, la Convention d’Ottawa et la Convention sur les armes à sous-munitions, et pour ne pas être partie au Traité d’interdiction complète des essais nucléaires et à la Cour pénale internationale. La Corée du Sud se classe au dernier rang sur la sécurité à cause de l’insuffisance de ses contributions aux efforts internationaux de maintien de la paix, à la timidité de son soutien au régime de sécurité internationale et au manque de données sur les exportations d’armes. La Pologne se retrouve également en fin de classement du fait de la faiblesse de ses contributions aux opérations de maintien de la paix et de sa non-ratification de la Convention sur les armes à sous-munitions. L’Australie est pénalisée pour ne pas avoir publié les données d’exportation du secteur de l’armement et la République tchèque en raison de ses vastes exportations d’armes à destination des pays pauvres ou non démocratiques. La mobilité de la main-d’œuvre peut être l’outil le plus puissant pour réduire la pauvreté et la redistribuer les revenus. En migrant vers les pays riches, les travailleurs acquièrent des compétences précieuses et élargissent leurs perspectives d’accroitre leur revenu. Ils envoient également des milliards de dollars chaque année vers leur pays d’origine, un flux qui dépasse largement celui de l’aide internationale. Le pays destinataire profite également de la contribution que les migrants apportent à l’économie et à la société. Le CDI récompense les pays qui accueillent les migrants et les étudiants des pays en voie de développement, acceptent les réfugiés et les demandeurs d’asile, adoptent des politiques d’intégration favorables aux migrants et signent des conventions internationales majeures visant à protéger les droits des migrants. L’Allemagne se place au premier rang pour les politiques migratoires, principalement pour avoir accueilli un grand nombre de migrants, de demandeurs d’asile et réfugiés. La Suède et la Nouvelle-Zélande se placent en deuxième et troisième positions. La Suède accueille une proportion importante de réfugiés et la Nouvelle-Zélande accueille de nombreux étudiants étrangers. Les deux pays appliquent des politiques d’intégration de qualité. La Corée du Sud et la Grèce ont toutes deux amélioré leurs performances par rapport à l’année dernière. Le Luxembourg présente le taux d’acceptation des migrants le plus élevé (pondéré en fonction de la pauvreté du pays d’origine des migrants). La République slovaque se retrouve en bas du classement de la composante migration. La Pologne et le Japon n’obtiennent pas non plus un bon classement en raison de leurs faibles taux d’acceptation des migrants et de leurs mauvais résultats sur leurs politiques d’intégration. La République tchèque se retrouve aussi parmi les derniers du classement. Rendez-vous sur le site cgdev.org/cdi pour en savoir plus sur l’Indice de l’engagement pour le développement, y compris les rapports pays, le portail Web interactif, le podcast, les calculs complets et le document de méthode. L’Indice de l’engagement pour le développement est compilé chaque année depuis 2003 par le Center for Global Development (CGD). Le CDG est un groupe de réflexion indépendant qui s’emploie à la réduction de la pauvreté et des inégalités dans le monde par de rigoureux travaux de recherche et un engagement actif auprès de la communauté politique. Ian Mitchell, maître de recherche sur la politique et directeur adjoint de CDG Europe dirige les activités de l’Indice, s’appuyant sur les travaux antérieurs d’Owen Barder, vice-président de CDG, et de David Roodman, ancien maître de recherche. Anita Käppeli, analyste des politiques rédige et dirige le développement du CDI. L’Indice est soutenu par le Consortium du CDI qui inclut en 2017 l’Australie, le Canada, le Danemark, la France, l’Allemagne et la Norvège. Le contenu de ce rapport ne reflète pas les opinions officielles des membres du Consortium. Les auteurs de ce rapport prennent la responsabilité des informations et points de vue exprimés dans ce rapport.